Trek Mount Fuji via the Fujinomiya Route. 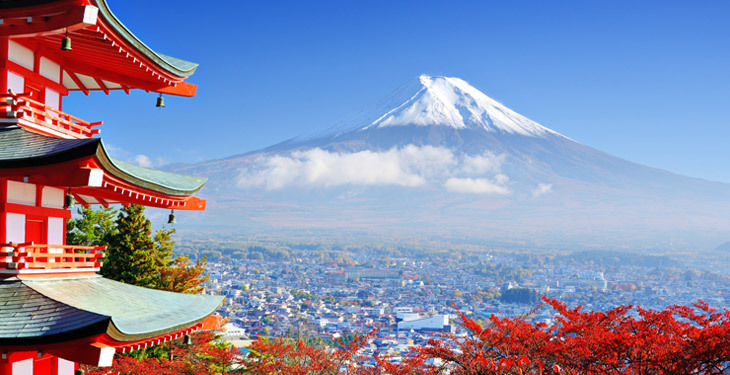 Summit the country's most iconic peak, Mount Fuji, and enjoy the exquisite culture of Japan. This guided Mount Fuji climb is the perfect way to take in Japan's rich cultural heritage and natural areas. 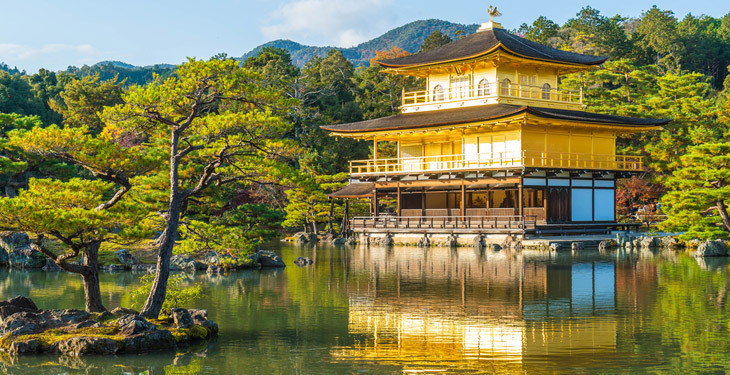 Arrive in historic Kyoto and enjoy a few days of touring the city’s historic sights. Soak up Japanese customs, visit temples, sample renowned cuisine, and do some light hiking around Kyoto before making your way to Mount Fuji via the high-speed bullet train! Climb this iconic mountain via the Fujinomiya and Gotemba trail variation in two days, overnighting in a high mountain hut just below the summit. After summiting, descend and travel to Hakone by van. Conclude your adventure with a tour of modern Toyko and participate in cultural activities with locals. 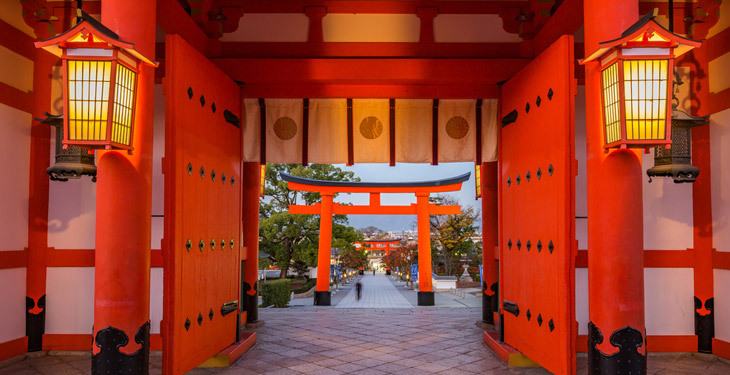 You'll have the chance to overnight in a traditional Japanes-style home (Machiya), partake in a traditional Sukiyaki welcome dinner, watch a Geisha dance, and visit the ancient temples of historical Kyoto on this once-in-a-lifetime experience! Arrive in Tokyo at Haneda International Airport (HND), Narita International Airport (NRT), Kansai International Airport (KIX) or Osaka International Itami Airport (ITM) and arrange transportation to Kyoto via train or taxi on your own. Meet at the hotel in Kyoto and relax after a long day of traveling (a 7-day Japan Rail Pass is provided by Mountain Gurus). 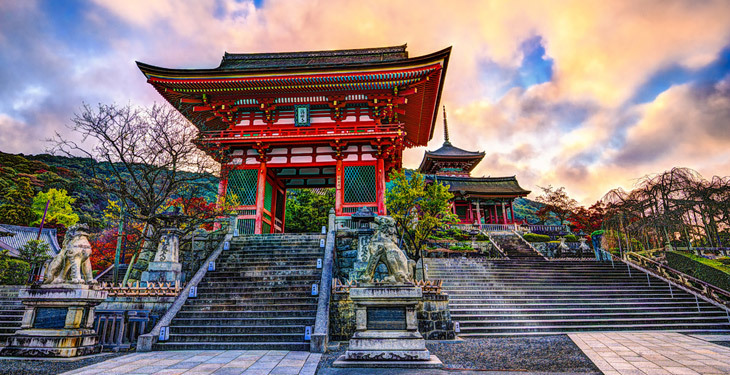 Following breakfast, you'll visit the Shinto wonderland of Fushimi Inari Taisha (Red Gate Shrine) and hike two hours to the top of Inari Mountain 765 feet (233 m) at the far southern end of the Higashiyama Mountains. Returning by rail to Maiko Theater, you'll experience a traditional lunch and cultural dance performed by a Maiko, a Geisha (Geiko) in training. Then visit Kennin-ji Temple Hojo with it’s relaxing Zen gardens, and the Ninen-zaka and Sannen-zaka preserved tourist districts. Afterwards, you'll have time to explore and shop on your own. 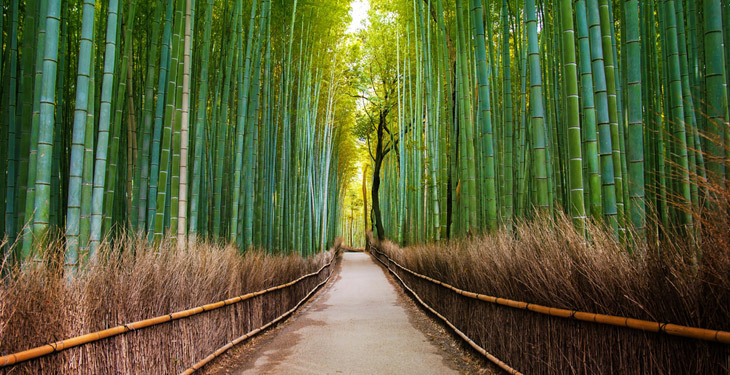 Today enjoy a walking and public transportation tour of historic Kyoto, visiting famous parks and temples such as Arashiyama (bamboo forest), Kinkakuji (Golden Pavilion), Ginkaku-ji Temple (Silver Pavilion), and the Philosopher’s Walk. 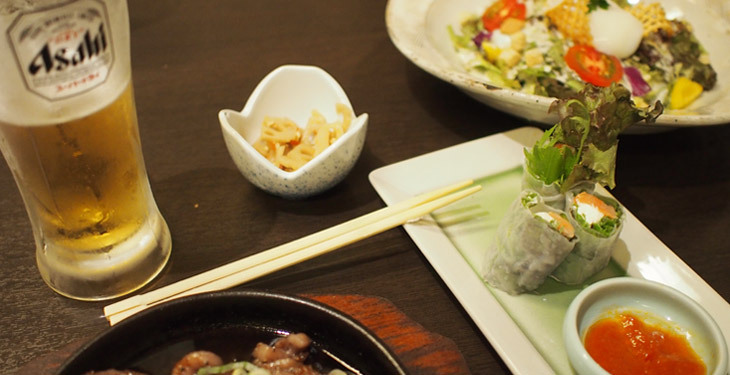 In the evening, you'll have a traditional Japanese welcome dinner across the Shirakawa canal (White River) towards downtown in the narrow streets filled with nice restaurants and ryokans. If time allows, you'll visit souvenir shops and the Nishiki Market, Kyoto’s largest traditional food market, before departing towards Mount Fuji. You'll take the famous high-speed Shinkansen (bullet train) reaching speeds of 150-200 miles per hour! Once near the mountain, you'll spend the evening preparing for the next day's climb and enjoying dinner in a local Japanese restaurant. After breakfast, transfer to the Fifth Station (trailhead) by bus and begin your trek up Mount Fuji to a high hut located between 9,500-11,000 feet where you'll enjoy the views and spend the night. Mount Fuji has four main routes to it’s crater summit and you'll choose your route based on the interests of the group. Wake up early and begin the hike, reaching Mount Fuji’s crater rim as the sun rises out of the western sky; this morning light is called goraiko or “arrival of light.” There are eight peaks around the crater at the summit and the highest point in Japan is Ken-ga-mine near the Mount Fuji Radar Station. After enjoying the summit, you’ll descend an ash-covered path to the Fifth Station trailhead. You'll then transfer to Hakone by van and overnight at a ryokan, which is a type of traditional Japanese inn with onsen bath. Spend your last full day in Japan touring Tokyo by public transportation for a true insider experience. Popular attractions include Senso-ji Temple and Asakusa, Ueno Park, Tokyo Tower, Odaiba, and Rainbow Bridge. The tour ends in Tokyo at hotel check-out. Arrange for transportation to Tokyo Haneda Airport (HND) or Narita International Airport (NRT) for flights home. The Earth is an amazing place and it’s our goal to share our passion for these amazing places with you and to help you get out and discover your world. Let us plan your next adventure. Mountain Gurus is a mountain guide service based in Issaquah, Washington. They specialize in Seven Summits, international climbing expeditions, Northwest climbs/mountaineering courses, and worldwide treks and adventures. 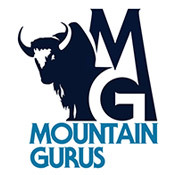 Founded in 2008, Mountain Gurus is a guide owned and operated company. Their mountain guides are among the most dedicated in the industry and draw on their extensive experience from exploring and climbing in some of the most remote places on earth. They are highly skilled professionals and are committed to providing their climbing clients with the individual care and safety concern they expect. As adventure travel experts they offer personalized service and will always take the time to make sure all your questions are answered. Mountain Gurus offers knowledgeable guides and quality services to ensure you have a safe, successful, and memorable experience. Year after year many clients return as friends to share in their passion for the mountains. The Earth is an amazing place and it is Mountain Gurus' goal to share their passion for these amazing places with you. Their programs are designed for aspiring climbers and outdoor enthusiasts of all skill levels. Whether you’re attending the Intro to Mountaineering Course, climbing to the summit of Mount Everest, or watching a pride of lions on the Serengeti, it is their belief that challenging yourself while exploring your world is truly one of life’s greatest experiences. I've been traveling with Mountain Gurus since 2011, every year to different places, and I always enjoy the trip. Dennis is always very good in organizing everything and very dedicated to his clients, making sure we have a memorable and safe trip. I highly recommended Mountain Gurus to anyone who wants a very organized and safe trip. Thank you Dennis! I came across Mountain Gurus a bit by chance, and am so grateful I did. I have a lot of experience hiking and backpacking, but have never been on a peak greater than the mid 14,000’s, and had no experience mountaineering. This trip was challenging both mentally and physically, but was an amazing experience. Prior to the trip I was in contact with Dennis regarding if this trip was appropriate for my level of experience, and after I booked, my specific questions about gear to make sure I was adequately prepared (the gear list is excellent… follow it and don’t compromise… gear can make all the difference in your experience… and if you don’t understand fully what an item is, just ask). Departure guaranteed! Please do not make travel arrangements until you have received confirmation from Mountain Gurus. Yes! However, please do not make travel arrangements until you have received confirmation from Mountain Gurus. The trip starts in Kyoto, Japan. Plan on flying into Tokyo at Haneda International Airport (HND), Narita International Airport (NRT), Kansai International Airport (KIX) or Osaka International Itami Airport (ITM) and arrange transportation to Kyoto via train or taxi on your own (Japanese rail pass is available to use on day 1). Please note that the trip ends in Tokyo, Japan. You should plan to fly out of Tokyo Haneda Airport (HND) or Narita International Airport (NRT). You'll be staying in a traditional Japanese-style home while in Kyoto for three nights (with a combination of Japanese futon and western beds). These homes are operated more like private hotels since there will be housekeeping staff during the day. Single accommodations at the traditional Japanese-style home are not available as this is a shared living environment. One night on Mount Fuji we’ll be in a bunk-style mountain hut (sleeping blankets will be provided from the caretakers). The remaining three nights during the tour will be in comfortable hotels. Price is based on double occupancy. If you are traveling alone and cannot be matched or wish to have a private room, you must pay a single supplement fee of $500 directly to Mountain Gurus. Single accommodations are not available in Kyoto. In August there is no snow on Mount Fuji. Therefore, ice axes, crampons, or special equipment aren’t needed. Only trekking poles and a day pack is required. Plan to prepare lunch and snack food as this service is not included during the climbing portion of the program. For a list of included meals, please see the itinerary. Do I need any prior mountaineering experience? Mountaineering climbing experience is not required, and anyone with strong physical fitness is welcome to join the trek. The trail is snow free during the summer hiking season and only requires trekking poles. A complete clothing and equipment list specific to your program will be sent to you in the pre-departure packet upon receiving your confirmation from Mountain Gurus. For your safety and comfort it is extremely important that you adhere strictly to the equipment list. You’ll be responsible for personal gear, such as a backpack, trekking poles, and your personal hiking clothing. Plan to budget about $300 extra for non-included meals and other items not included in the trip cost. Book confidently with Free Cancellations within 72 hours of booking. After 72 hours, cancellation fees will apply. Cancellations are subject to the full discretion of Mountain Gurus. For more information on our Travel Cancellation Policy please Click Here.